Back in 1903, Congress created the Office of the Director of the Civilian Marksmanship Program. The original purpose of the program was to teach civilians the skills they would need if they were one day needed for military service. This is, in many ways, the epitome of what the 2nd Amendment is all about: the government trusting the people to be armed because the people are the government. 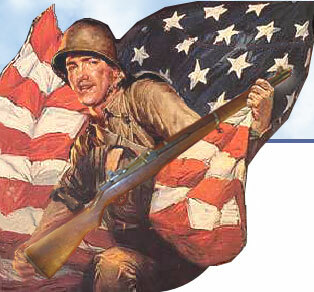 CMP is really all about one rifle: the M1 Garand. This is the rifle which beat the Nazis in WW2 and is possibly the greatest rifle ever designed. Those interested in shooting in the CMP or VMR (Vintage Military Rifle) program are also likely interested in purchasing their own M1 Garand. Membership in our club gives you access to that program. This link will take you to the page that explains that process: http://thecmp.org/cmp_sales/. Other Vintage Military rifles are eligible to participate as well. We ask that they be in "as issued" condition and the closer to "stock". . . .the better. TCRGC members pay a small fee to shoot 35 rounds. Non members pay slightly more. Prices will vary based on NRA Foundation grants so check latest email and flyers or email Gary Kim above. Targets, rifles, and ammo are provided. You may also bring your own rifle and ammo and just pay the normal range fee.